Blue Quantum pads spread the perfect coat of glaze over anypainted finish. Use Blue Quantum Pads with Black Light, White Light, orGlossWorkz Glaze. Blue Quantum Pads are finishing pads; they have no cut and donot remove any paint. Breathable backing attachmentconducts airflow and heat moreefficiently than older pads. 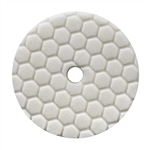 Hex-Logic surface groovesspread product evenly and conform pad to contoured surfaces. Improved adhesives and manufacturing techniques ensures astrong bond that will not detach backing attachment from foam pad. Blue Quantum Glazing Pads have no cut, and are perfect for spreading finishing products over painted finishes. Use the Blue Quantum Pad to spread the perfect coat of gloss-enhancing glaze like Black Light, White Light, or GlossWorkz Glaze over freshly-polished paint finishes. The new Quantum design represents a great leap forward in polishing pad technology. Innovative new foam polishing pads smoothly transfer power from the polishing machine into paint while minimizing heat, wear and tear, and user fatigue. High endurance Quantum pads are designed for dual action polishers, long-throw orbital machines, and high speed rotary buffers. Quantum Hex-Logic Pads combine new pad geometry with tried-and-true Hex-Logic grooves to ensure maximum coverage, enhanced cooling, and fast and efficient work. R&D fitted the new Quantum pads with a more durable and breathable hook and loop interface plate for a stronger bond that conducts heat away from the machine and pad. The precision-cut Race Face creates a gradual tapered profile to spread out compression from the user’s hands and reduce wear and tear on the foam pad. Improved manufacturing techniques, adhesives, and materials ensure that Quantum Hex-Logic Pads last longer for better polishing results job after job. By understanding the physics of polishing, Quantum Hex-Logic engineers extended the lifespan and efficiency of Quantum polishing pads by adding a Precision Port vent hole. Venting the pad where it spins the fastest reduces torque stresses on the material and channels heat away from the hottest part of the pad. Quantum polishing pads come in the full Hex-Logic color spectrum, so there’s a Quantum Pad for every compounding, polishing, and finishing job on any vehicle. Pick up the new Quantum Hex-Logic buffing and polishing pads for a polishing experience that changes everything. While cutting and polishing pads remove paint to restore gloss and shine, finishing pads have no cut and only spread the perfect coat of glaze for added gloss and wet shine. The soft spreading action of Blue Quantum pads is perfect for applying the perfect coat of glaze with minimal product waste. Use Blue Quantum pads to spread the perfect coat of glaze like Black Light, White Light, GlossWorkz, or EZ Creme Glaze. Spreading products like glaze, sealant, and wax by machine uses the smallest amount of product for maximum results with minimal product use. When used correctly, finishing pads can use one bottle to glaze dozens of vehicles by machine. Traditional buffing pad designs can’t take the physical stresses from polishing. Regular foam pads are prone to failures in the hook and loop backing system, internal foam breakdown, and burning and melting from high speed rotation. While old school rotary polishers spin on one axis and create even stresses across a buffing pad, modern dual action machines spin and oscillate and create extra stresses and strain. With dual action mechanisms oscillating between 2mm and 26mm, extra friction and torque strain on the foam can be immense. Quantum engineers designed the new buffing pads with a Precision Port center-cut hole to reduce stresses and heat buildup in the center of the pad. The pad’s center experiences the most torque stress and heat buildup, so venting the pad there eliminates the greatest tearing forces and heat that destroys pads and machines. New hook and loop backing material channels in fresh air through vented TORQ backing plates, and cools the polishing foam and machine polisherat the same time. Traditional foam pads have a recessed step-down profile from backing pad to foam buffing side; this design ensures the backing plate never touches the vehicle, but it is prone to wear from heavy-handed user input on the buffing machine. Quantum pads use a gradual Race Face tapered profile for one unbroken line from backing pad to foam buffing surface; this design spreads out any forces from the user pressing down on the machine and saves the pad from excess wear and tear. Quantum buffing pads are designed to be the best polishing pads for any professional or enthusiast detailer. The combination of buffing pad, machine speed, and polishing compound affects the amount of heat generated, and how muchpaint is cut away. The all new Quantum polishing pads are engineered and designed to generate the safest and most efficient cutting power on today’s powerful dual action and high speed rotary polishers. Quantum Pads cut quickly to remove deep defects,swirls, scratches, and oxidation, then refine the finish to restore gloss, reflection, and shine to any color paint finish. Traditional buffing pads can generate too much heat when used incorrectly, which harms paint finishes and destroys the pads themselves.Quantum Pads use advanced backing material to draw in cool air through vented backing plates, a Precision Port center hole to dissipate excess heat and torque forces, and tried and tested Hex-Logic grooves to spread product evenly and draw in fresh airas the pad rotates. The bowed Race Face profile increases buffing surface area and spreads buffing forces evenly across thebacking pad for reduced strain and wear and tear. All these features deliver the fastest foam pad cut while reducing excess heat and torque tearing concerns. Quantum polishing Pads are the new standard for foam polishing pads on today’s newest and fastest buffing machines.